It’s a tough job but someone has to do it. Actually it’s not only someone but a whole team of individuals who unite in a joint effort to give you the experience of a lifetime. From the moment each guest arrives, until the moment they bid farewell, the DelSuites’ staff team is working diligently to ensure that individuals and their families are having the very best experience. Whether you’re checking in to a fully-furnished rental suite for a week or longer, you can relax in the comfort that can be found in your home away from home. Even before your day begins, the guest services team is responding to emails, verifying schedules and generally planning their day before they hit the office. As part of the joint effort, each team member monitors a 24-hour guest service’s hotline (including evenings and weekends) to ensure your needs are always met. When it comes to maintaining well-appointed suites, it’s not only up to the cleaning staff. Each guest services team member is in touch with housekeeping supervisors, to review the schedules and ensure that arrival, departures and guests’ special requests are completed in a timely manner. Special requests might mean that housekeeping staff are required to handle emergency cleanings that require additional staff assistance. Through regular communication between housekeeping supervisors and guest services, we are able to provide a high-quality standard of cleaning each and every time. From sourcing replacement electronics to selecting custom furnishings, the staff at Delsuites makes it a priority to ensure your stay is enjoyable and comfortable. In fact, it’s through their direct contact with guests that team members gather a sense of the items that will make life away from home, even better for everyone. While most days it may be a little hectic for guest services staff, there’s certainly never a dull moment. In fact, for many staff, it’s the diverse nature of the job that keeps them energized each day. Similar to the backstage of a concert or theatre performance, you never really know what goes on behind the scenes but when all goes according to plan, it makes for one incredibly memorable experience. DelSuites Toronto furnished apartments’ success is achieved by providing the ultimate customer service experience – one guest at a time. We care about what our guests think. To see through feedback and reviews, we have the opportunity to observe our operations from the same perspective as our guest. It’s very insightful to ‘walk a mile in their shoes’ from time to time. 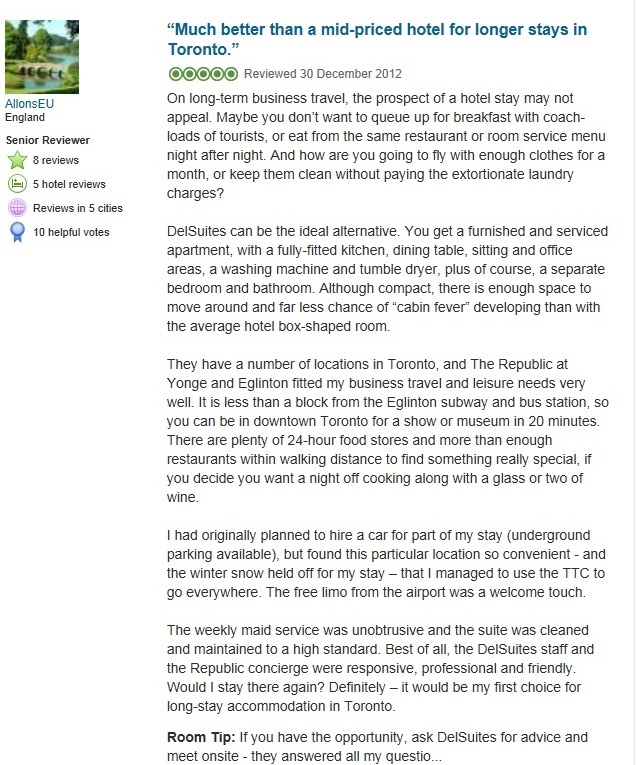 Below is a recent guest review that was posted on Tripadvisor on his satisfied experience in our furnished suite in Toronto. 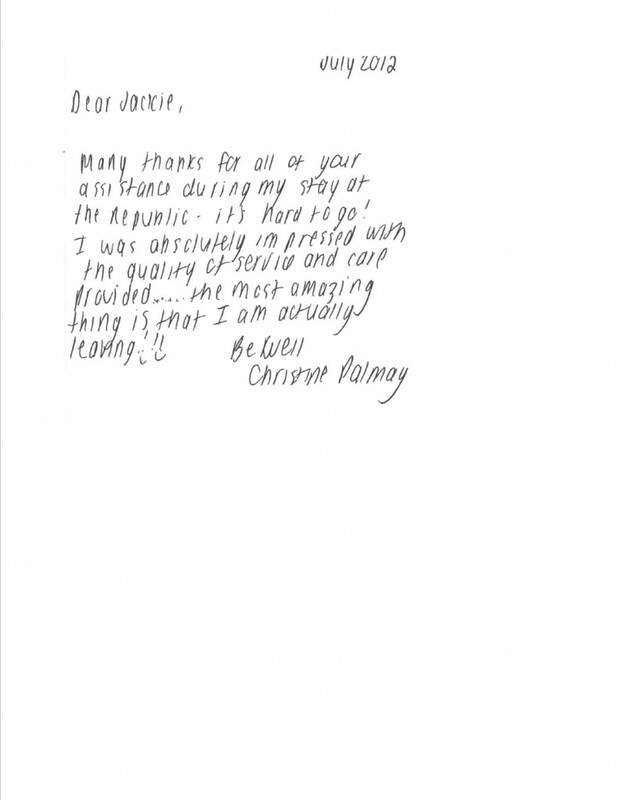 To read more guest comments on Tripadvisor, click here.